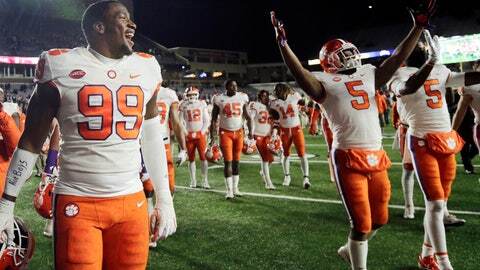 CLEMSON, S.C. (AP) — Clemson left guard John Simpson is excited about the Tigers‘ latest achievement. He’s even more thrilled for what comes next. Second-ranked Clemson (10-0, 7-0 Atlantic Coast Conference, CFP 2) clinched its fourth straight ACC Atlantic Division title — and seventh in 10 years — with a 27-7 win over No. 22 Boston College on Saturday night. But Simpson said the Tigers are focused on accomplishments beyond the division, including staying undefeated to maintain its status in the College Football Playoff poll. The next hurdle in that journey is Duke (7-3, 3-3) at home on Saturday night. A Clemson victory would complete its second perfect run in ACC play in the past four years since the national runner up team in 2015 started 14-0 before falling to Alabama in the CFP title game. Tigers coach Dabo Swinney has long told staffers and players to enjoy the moment while keeping sight of what’s next. Swinney said it’s not easy to be expected to succeed and then go do it with team after team looking to take you down. “I know people, fans, get caught up in bigger things like playoffs and all that stuff,” Swinney said. But “I still remember our first division win (in 2009) and I want to make sure that we enjoy” clinching the latest one. Now, though, it’s back to work when any loss could mean the end of Clemson’s latest playoff run. After Duke, which is nearly a four-touchdown underdog, Clemson faces inconsistent rival South Carolina at home on Nov. 24 before facing the ACC Coastal winner — right now, Pittsburgh is in the driver’s seat — in Charlotte, North Carolina on Dec. 1. Clemson’s offense continues to thrive with young players like freshman quarterback Trevor Lawrence a nd sophomore tailback Travis Etienne leading the way. There’s always concern, co-offensive coordinator Tony Elliott said, with newer players of letting up the intensity with the division race complete. Elliott said Clemson’s experienced leaders take control of setting expectations and the week-to-week tone of keeping focused and sharp. Clemson has certainly shown that down the stretch the past few seasons. The Tigers are 18-3 after October the past four seasons with two of those losses coming to the Crimson Tide in CFP contests. Freshman receiver Justyn Ross, who’s second on the Tigers with five TD catches, said the newcomers entered the program knowing what’s expected and don’t plan to slip up. Clemson left tackle Mitch Hyatt, who set a program record for most snaps, missed much of the Boston College win after a couple of hits that injured his shoulder, Swinney said. Elliott said Hyatt, a senior who passed up a likely high-round NFL selection last year for a final college season, felt better on Monday and would continue to receive treatment. If Hyatt can’t play, the Tigers would call on five-star freshman Jackson Carman once more. Carman, at 6-foot-5, 345 pounds, was the top high school prospect in Ohio last recruiting cycle. He filled in against Boston College and, in Elliott’s view, performed well.